You must be wondering who I am or which era I belong to. Well I am the collective memory. When anyone thinks of an English country home and hearth and joy I am the picture that they create. Many families have lived in my hearth, few have made them home. If you thought home was about the four walls, sorry it is about people. When people make me their home, their lives are documented in my bricks as memory. Haven’t you realized that when you go back to your old home, it was not the walls that you are going back to, it is your childhood. I remember Grandpa William telling his son, Colin, never make your home in a place. Make a home for yourself inside your own head. You’ll find what you need to furnish it – memory friends that you can trust, love of learning and other such things. That will go along with you wherever you journey. Speaking of memory and furniture, just a few days back young William, decided to get Grandpa Williams bed polished. On second thoughts he decided to do it himself. There were names and dates, William was amused until he hit William Stuart Jr. 1955 that’s when he realized it, for generations till his grandpa William all family events were etched on to the word work. The family clustered round the bed, trying to find what the years meant. Birth of great-aunt Dorothy the year that uncles Jonathan died. Suddenly William said well we need to complete the family tree. This sounded so much like Ann Grandpa Williams aunt who married a missionary no matter what her family said and left away to some deep African jungle. Funny how these strains manifest, young William now takes after his aunty though he does not realize it, he is a tree doctor, goes around grafting trees, to create new medicines, little Ann went with her missionaries because the Jungle called, but for Henry who is probably the earliest clear memory I have, trees, nothing was more fascinating or holy than a strong tree. He would just resist cutting them, because, he felt it laying the land naked, to the sun, it was like destroying history. “nothing a pound and bottle of wine cannot cure “Henry had declare, to his wife, and it had turned true. I am a bit tired now, being in my physical state, stricken, and cannot bear to live much longer. The tree beside me says, be still, look at me, life is not easy, it is not difficult either, you with all those joyous memories should overcome this. How could I tell him, that thoughts have now gone silent, I am anxious because the children’s path leads them away from mother and home? “Father, the house is tired, we need to break it down and build a new one” Williams’s son seem to say. Poor, boy he does not realize life leads you home. Every path is homeward. Every step is birth. Every step is death, every grave is mother. As the tree rustles in the evening that is the uneasy though,, very childish thoughts, though the thoughts of trees are long, restful after all they were meant to have lives longer than ours. Mine or the people who lived in me. They are wiser than the people who walk past them, when you listen to these you realize to want to be nothing except what you ae, is home, that is happiness. 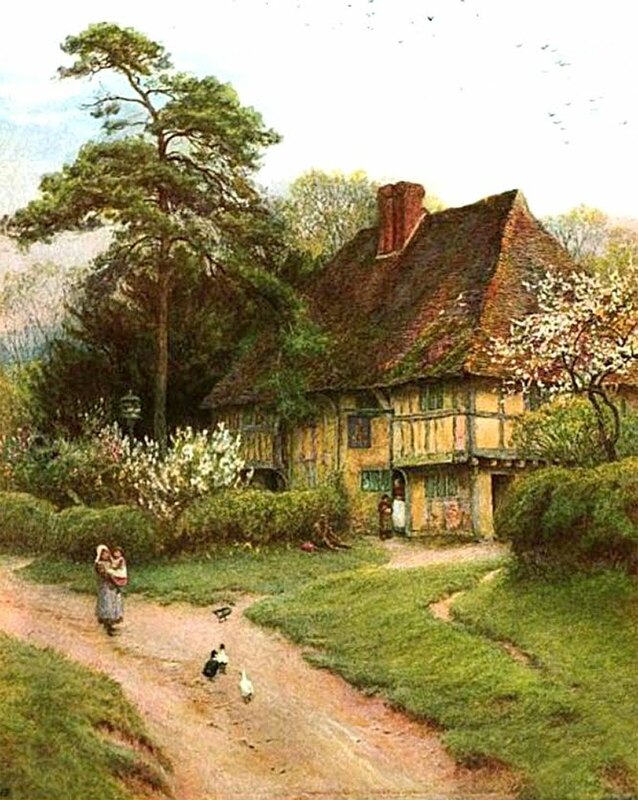 Do I sound like someone rambling disjointedly, probably I am growing old, getting senile after all five generations of Stuarts have lived here.I am happy where I am, William and his family move from the hearth in their home, to their home in the earth, I carry the shadow that they cast. thanks will run the spell check. Previous PostPrevious Kimmers Vigilante – Jolly good show.